“Pinkalicious” is onstage now through May 13 at the Children's Theatre at Willow Lawn. After years of reading Pinkalicious to my girls, 13, 11, and 5, I was excited and curious to see how the stories about a bright, plucky, pink-loving girl would be transformed for the theatre. In what kind of pickle would Pinkalicious find herself? In what way would her penchant for pink impact those around her? With frequent, rollicking musical numbers and relatable themes, this fast-paced show did not disappoint! Pinkalicious tells the story of a pink-loving girl who, like many of us, ends up in trouble after eating too many sweets. In her case, overindulgence causes her entire body to turn pink. Her “pinkititis” brings many challenges to the protagonist, including distressed parents, a jealous brother, and an upset friend. Tyandria Jackson is charming, sweet, and bubbly in the lead role. She deftly handles the drama surrounding her color transformation, even being chased by a bumblebee and bird. Throughout the story, the audience can’t help but root for her. There are elements of family life many audience members will relate to, from dinnertime drama to sibling rivalry. When Pinkalicious’ brother Peter responds to her pinkness by saying, “She always gets to do the fun stuff!” it feels so achingly familiar. Peter often struggles to get his parents’ attention, but at times there are sweet moments between the siblings. The struggles Pinkalicious’ mother faces are real, from trying to feed her kids healthfully to managing the busy distractedness of her life. I could completely relate – if only I could sing as beautifully at bedtime as actress Rebecca Turner (as the mom of Pinkalicous). Anthony Cosby as Peter, the tattling and goofy brother, brings a welcome physical comedy that keeps kids entertained. At one point, all he did was lope out on the stage while looking through binoculars, and the audience burst into laughter. His level of commitment to the performance made him so much fun to watch, especially in the dance numbers. Brent Deekens, who played Pinkalicious’ father, also garnered laughs with his funny gestures and facial expressions. Throughout the play, Deekens often looks like he’s thinking of a funny joke, and his subtle gestures keep the parents entertained. 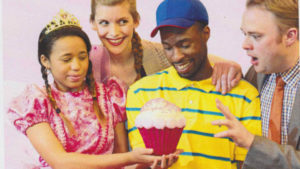 Some of the funniest moments in the play included Deekens as an angry cupcake in Pinkalicious’ sugar-induced dream. Desiree Dabney also brought humor to the show in her roles as Dr. Wink and the bumblebee. Her warmth and charisma made her my 11-year-old’s favorite character. Audrey Kate Taylor, as Pinkalicious’ best friend Alison, is adorable and expressive throughout, bringing to the show both the sweetness and the playground drama familiar to young audiences. Virginia Rep’s Pinkalicious will keep kids as young as four entertained with its catchy songs, humorous moments, and pinkatastic costumes. Older kids and parents will enjoy the story’s relatable themes and sweet messages. 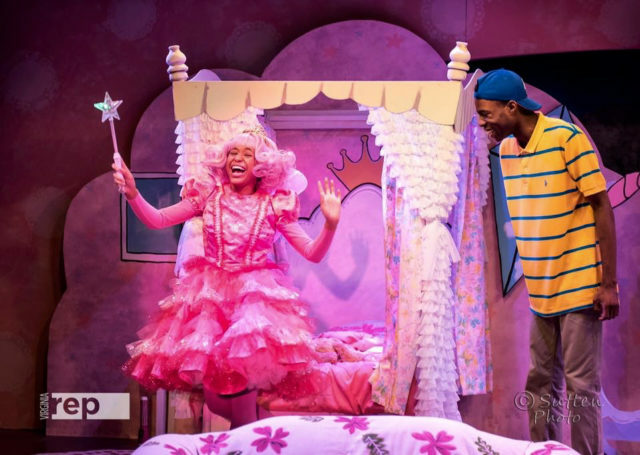 Pinkalicious runs through May 13 at Virginia Rep’s Children’s Theatre at Willow Lawn. Go here for showtimes and tickets. Check out Just Joan: RVA Storyteller for more on Tyandria Jackson, the 18-year-old star of Pinkalicous.